Numerous films barely remain lively after their sequels, much less reach their fourth installment without going straight to DVD. Seeing Tom Cruise, closing in on fifty, return to the screen as super spy Ethan Hunt hardly seems a selling point, but The Incredibles director Brad Bird brings us a film that hearkens back to when action films produced real stunts and real thrills. In the words of James Lipton, it’s a delight. The plots to these spy films rarely vary, and this one is no exception: Tom Cruise is busted out of a Russian prison in order stop a Russian nuclear scientist from starting a nuclear holocaust that he believes will help advance human evolution. Though I’ve mentioned Cruise’s age, you’ve got to give the man some serious credit for pulling off all of his stunts – and none of them are easy. Playing Spider-Man on the exterior of the world’s tallest building, Cruise’s high wire act is stunning, even if you’ve seen the behind the scenes video of the stunt’s production. Closing out with an elaborate, industrial-accident-waiting-to-happen, horrifying fight scene in a vending machines for cars, the film leaves on a great high note, even if its epilogue softens the afterglow. All credit is due to Brad Bird, whose camera placements transform the skyscraper stunt from potentially gimmicky to a vertigo-inducing sense of stunning wonder (mixed with a dash of terror). Given the 60’s spy swagger of his previous film The Incredibles, Brad Bird seemed destined to direct this film and his giddy enthusiasm for the material is evident. Simon Pegg’s extra screen time since the third outing and the addition of Jeremy Renner enhance Ethan’s dour disposition and the overall film, giving it some comedic spice and a tone that’s not unwilling to laugh at itself. Though the plot isn’t inspired and the film features not one, but two! 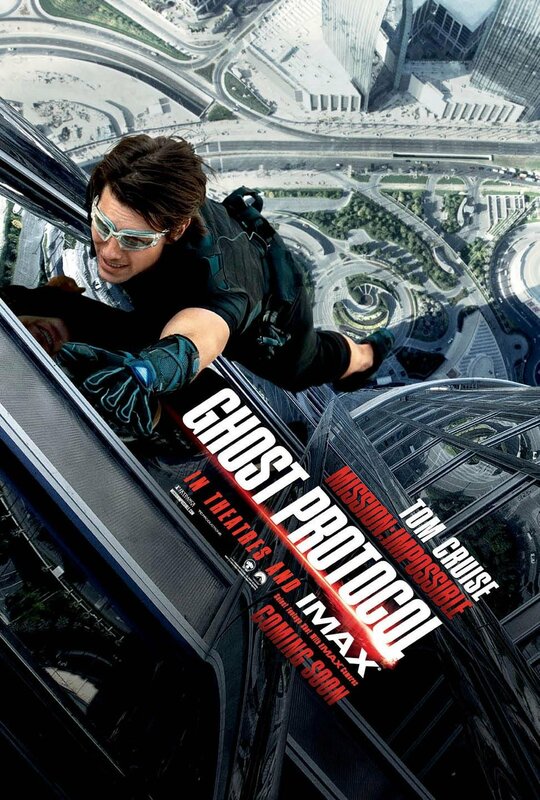 shots of Tom Cruise running away from CGI somethings looming behind him, the action and laughter vault Mission Impossible Ghost Protocol past ho-hum to decidedly silly-grin inducing heights. The trailer for Wrath of the Titans preceded the film and prompted my brother-in-law to wonder aloud, “Why do they keep making these? !” The answer of course, is because however dumb, if it’s packed with enough uninspired CGI, it will make beaucoup bucks. Going against such a dismal tide is what makes Mission Impossible 4 such a breath of fresh air. This entry was posted in Reviews and tagged Action, Brad Bird, Jeremy Renner, Mission Impossible: Ghost Protocol, Simon Pegg, Special Effects, The Incredibles, Tom Cruise. Bookmark the permalink.